M/V Algosoo enters Duluth Ship Canal, originally uploaded by pmarkham. I love visiting Duluth, MN and go there any time I can. I was in Duluth a couple of weeks ago for work and took a couple of evenings to wander around the waterfront to photograph stuff, despite the warm weather. One evening I captured this photo of the M/V Algosoo entering the Duluth Ship Canal. She was carrying a partial load of salt, which she will unloaded overnight and then moved to the ore docks to load taconite. 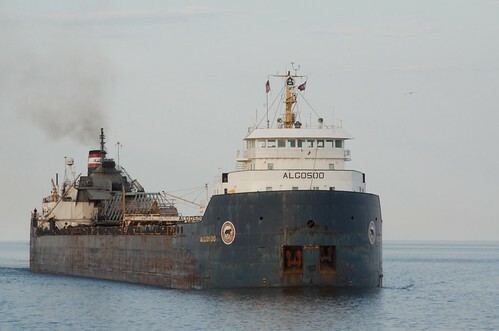 Algosoo is a 730 foot vessel that is designed to carry bulk cargo on the Great Lakes.